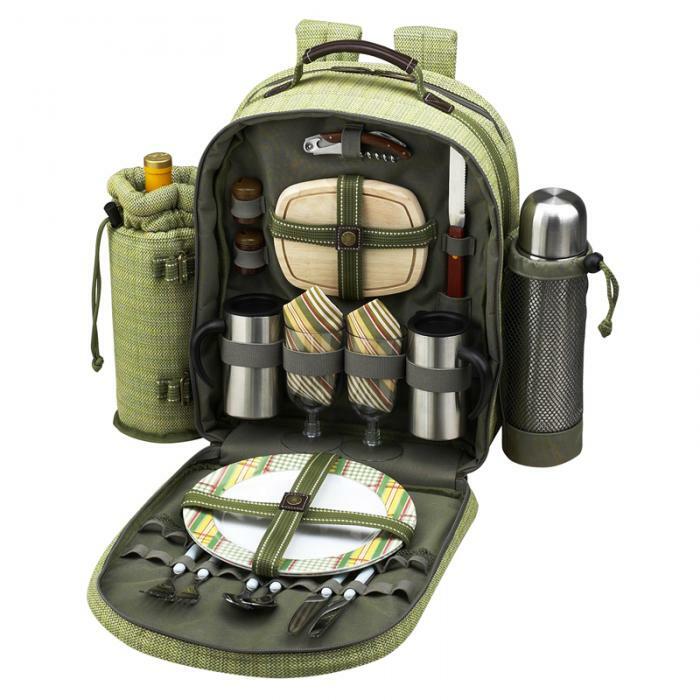 Fully equipped picnic backpack with coffee service for two is constructed of elegant tweed fabric. It includes: Stainless steel vacuum flask (24 ox), double walled insulated coffee mugs with caps, 9" melamine plates, stainless steel flatware, acrylic wine glasses, napkins, hardwood cutting board, cheese knife, wooden salt and pepper shakers with closing tops, and a combination corkscrew. Thermal Shield Insulated cooler compartment has a removable leak proof liner, and detachable wine/drink holder. Cotton Tweed/600D canvas construction from our Hamptons Collection. Designed and Assembled in the USA. Lifetime Warranty.